Decouple, Disconnect or Deliberate Plan? The hall was full. About 100 attended.I was sitting toward the front. It was very well organised: flip charts to record comments, sound system. What was especially interesting about the meeting, and also the earlier one at Belmont which was also well attended, was that they were instigated by the local community groups (not by the Local Board). So this one, and the one at Belmont were organised by the Belmont-Hauraki Residents Association. I understand a similar meeting was held at milford which was organised by the Milford Residents Association. Auckland council officers attended in each case, and so did members of the Local Board. These meetings, and the interest, and the swelling membership of these local resident associations, have obviously been in response to concerns raised by the intensification proposals that are in the Unitary Plan. They are grassroots responses, and should be taken seriously by council. They are an indication of what can be expected across Auckland as awareness of the implications of the intensification proposals grows in communities. Local resident, and Belmont-Hauraki Residents Association member Tony Keenan chaired and facilitated the meeting. Local Board members Mike Cohen, Grant Gillon, Jospeh Bergin and Jan O'Connor attended. Cllr George Wood arrived toward the end of the meeting. Richard Burton and Ms Hanson from Vision 2040 were present, as were officers from Auckland Council (Ross Moffat) and Auckland Transport (Scott McCarten). Tony explained that the community had expressed strong views about the intensification proposals that were in the draft unitary plan. And that people were worried about infrastructure provisions - because the unitary plan effectively de-coupled infrastructure provision from intensification. He said that "normal planning integrates that". He said that "now we have that gap-filling in planning via the Area Plan..." The question now is what infrastructure is needed upfront, and what level of infrastructure maintenance is needed to ensure infrastructure and services don't erode.We need to plan for their upgrades...."
1) What do you like and value in your area? 2) What would make it an even better place to live? 3) What services and amenities ought to be provided? The meeting was informed that the earlier meeting at Belmont (on Monday) had expressed concerns about transport infrastructure, ferries, buses, schools, wastewater and stormwater. Burton for 2040 talked about "residential character". There was an animated discussion and notes were taken which will be provided as feedback. There were many comments about Lake Road congestion. One or two wanted the cycle lanes taken out to provide more space for cars (thankfully only one or two!). Scott from Auckland Transport indicated that a $56 million provision to improve Lake Road (not sure what this entailed) had been pushed back in the plan to 2022, to provide for "higher priority projects". AMETI, CBD Bus Upgrade, CRL, Onehunga motorway link, and Whangaparaoa roading projects were mentioned. This was the resolution that was adopted by the meeting. There was significant concern at the lack of connection, integration, coordination between intensification plans and infrastructure provision. In my opinion, this disconnect is deliberate, because the objective of the approach pursued by Council is to remove obstacles to building and development activity across the Auckland urban environment. That is why the Unitary Plan has a few simple zones - with few rules, and that is why there is no obligation imposed on developers to upgrade infrastructure, and it also why there are no structure plan requirements for urban areas that have been up-zoned. These requirements are seen by some as obstacles to growth and economic activity. However these requirements are the minimum in most other western countries, where people expect systems to be in place to protect them and their communities from the effects of up-zoning, through comprehensive area planning which includes infrastructure and suchlike. Again, in my opinion, Council is making a rod for its back, and for the backs of it communities, by pushing ahead with this market-led approach to urban regeneration. Communities will resist it. It begins with agitation, moves into education (as residents inform themselves and get to grips with urban planning and what is reasonable and fair), and then to organisation. These local groups are getting very organised. Auckland Councillors need to take notice. You can make out the original net shed just above and right of centre... with a couple of fishing boats moored across North Wharf, and a vehicle ferry to the right. Wynyard Wharf is bottom right. You can see a couple of trawlers moored, and perhaps one end of the Kestrel. This is another picture, showing the state of the wharf timbers on Wynyard Wharf. 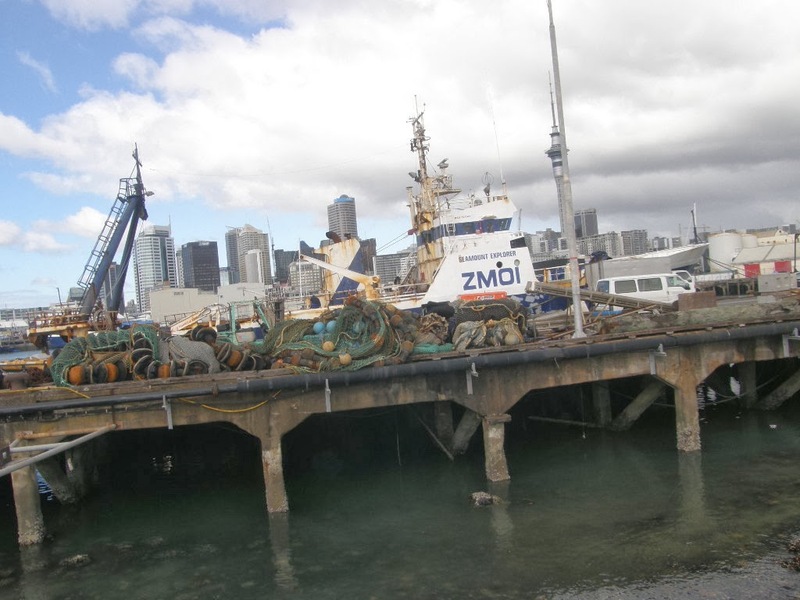 This image is from the cover of the Wynyard Quarter Precinct Plan 1 document, which is dated July 2009, and was prepared by Sea + City, a subsidiary of Auckland Regional Holdings, governed by Auckland Regional Council. The purpose of the Precinct Plan is to: "....take the principles established in the Urban Design Framework (UDF) and Plan Changes 3 and 4 and apply them to Precinct 1..."
This diagram is from pg 20 of the precinct plan, and relates to the UDF principle: "Active and Working Waterfront". It shows fishing boats moored along North Wharf - as they did pre-development. No fishing boats are shown on Wynyard Wharf. It is not clear from this diagram where fishing nets and related activities would be located. The text describing the map is shown here. It describes what the precinct plan response is: "Retain Existing Marine Uses. The Precinct's regionally significant fishing and marine industries provide authentic experiences. Maintaining these...... is a key aspect of establishing the identity of the Precinct...."
This map is taken from pg 24 of the document which relates to the UDF Principle 6: Facilitating a mix of uses and activities. Note reference to "active fishing industry..."
Further on in the Precinct Plan, are the design guidelines established to implement the principles. This diagram is from pg 58 which contains the design guidelines for North Wharf. This indicates that the sea and berthing space opposite the refurbished net shed was to continue as "fishing fleet berthage", and that there was to be a 5 metre wide "fishing service access zone" - which left a generous pedestrian circulation zone. This is visualised in the Precinct Plan at pg 59. And it has been very successful - as an entertainment precinct. But, as this picture shows, the 5 metre service zone now contains seating. And whenever I go down there now for a beer or a bite, I don't see any fishing boats moored along North Wharf. Some say that Wynyard Quarter is at risk of losing the gritty edge it had. Losing its authenticity. More of a theme park. An outside Westfields Mall experience. The Viaduct development will be remembered by many as one where private apartment interests successfully drove the fishing fleet out. Is the same thing happening at Wynyard Quarter? The Active and Working Waterfront UDF principle is an important one. It needs to be protected and implemented. Auckland Cruise Ship Visits: How Lucrative? There's something about Cruise Ships that sends thinking people into a swoon. They conjure up feelings of adventure, drama and the mystique of exploration and travel to unknown parts. I like the look and feel of them, enjoy them being in Waitemata Harbour, enjoy the sound of their horns as they come and go, and sometime would like to go on one (interesting options in the Eastern end of the Mediterranean, the Baltic and a specialist one with on-board zodiacs touring Patagonia). But that doesn't mean that I support them being able to park in Auckland's CBD waterfront. On our front lawn. Because I don't think it's economically justified (see below), and because I think the priority should be providing for public space and public activity. Other cities around the world have been lulled by them into providing extensively for them to dock in the heart of the city - at the expense of providing public space and amenity for the local, population. And in most cases they've rethought those plans, and relocated cruise ship facilities away from the CBD, but near enough for passengers to enjoy and to visit. Baltimore is one such city. It was one of the first city harbours to de-industrialise and to transform. The transformation process began almost 50 years ago. Then, a key goal was to attract private investment into brownfield waterfront lands. Local government institution invested millions in waterfront infrastructure, and attractions like museums, aquaria, warships and the like, and then terminals for cruise-ships. This was public investment. An economic stimulus. And cruise ships came. Cruise ship operators are always on the lookout for a destination to include in their routes. After a few years of this, local leaders noticed that the people who were attracted to the Baltimore waterfront were either tourists, or the wealthy locals - who could afford the expensive fees charged by the facilities that had been developed. But it was not a popular waterfront. It was not a people's waterfront. It had become a destination for tourists (who often didn't have much to spend anyway) and wealthy locals who liked the harbour views and could afford the restaurants. So decisions were made to change the emphasis and purpose of the waterfront. To make it attractive for all Baltimore citizens - including low income families. This led to policy changes including the development of low cost public transport links to the waterfront, and the development of large well designed park spaces on the waterfront. You can see here, by the way, a comparison of the amount of public space there is in Baltimore's CBD waterfront, with Auckland's at present. There's been a few cruise ships visiting Auckland lately. Hundreds of visitors stand confusedly on Queens Wharf, wondering what to do. Groups huddle around piles of suitcases - looking a little like migrants or asylum seekers. Hundreds take the ferry to Devonport. And of course many spill up Queen Street and environs. I was at a meeting recently where a consultant - known for his enthusiasm for cruise ships and for them being able to dock on Auckland's door step - said, "every cruise ship visit brings a million dollars into the Auckland economy...."
When I was at the Auckland Regional Council a cruise ship passenger survey was conducted to provide answers to a variety of questions. The survey - which is dated April 2009 - I know, it's a bit out of date - contains useful information. "Face to face surveys were deemed preferable.... TNS, a market research company, carried out 241 face to face interviews... at least 425 total people were surveyed... passengers from 5 different cruise liners were included.... Aurora, Millenium, Volendam, Seven Seas, Silver Shadow..."
27% of the passengers were from Australia, 29% from the USA, and 27% from the UK. For half the passengers, this was their first visit to New Zealand. There is a lot of info in the report, which quotes substantially from the qualitative data collected. "...a conservative estimate of the value of the spend of each passenger would be at least $200..."
This was over an average stay length of two full days. The report describes what people did while they were in Auckland, mentions coffee, souvenirs, and dining out and suchlike. In the 2005/2006 season, POAL catered for 48 cruise ship visits (at the Overseas Passenger Terminal, Princes Wharf), with more than 100,000 passengers passing through the port, mostly disembarking for short stopover trips into Auckland or the surrounding region. Each of the ships is estimated to add about NZ$1 million to the regional economy. For 2007/2008, the total was forecast at 73 ship visits, another strong increase. So far, the largest ship to visit was the Queen Mary 2, which had to be diverted to Jellicoe Wharf in the freight part of the port due to its size. However, the largest one-day turnover came in February 2007, when the Statendam and the Sapphire Princess were due in Auckland to exchange around 8,000 people at the terminal, the equivalent of 19 Boeing 747 jumbo jets. In 2013, Auckland won a major cruise ship industry award, being named Best Turnaround Destination (best location to start or end a cruise at) by Britain’s Cruise Insight magazine based on a survey of industry leaders. which gives a clue as to the source of that entry in Wikipedia. If we assume 100 cruise ship visits/year to Auckland, with 2,000 passengers each, spending $200 each (according to the survey), then the total spend for the year is $40,000,000, from 200,000 passengers. (This needs to be seen alongside the cost of the cruise - the survey reports that the average spend of each passenger to buy their cruise was "just a few thousand dollars per person - for well over half" the survey sample. These are not wealthy people on the whole.) Worth having, but hardly a fortune. But the cost to Auckland Inc for that benefit is huge. 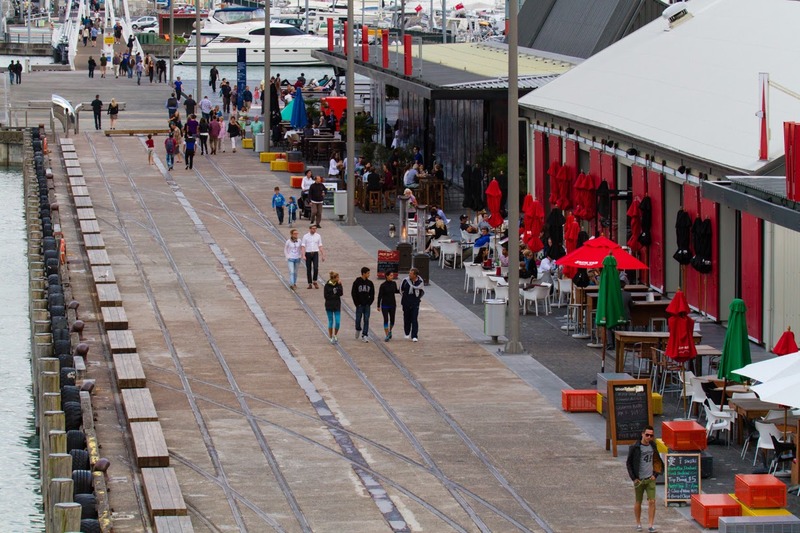 It is at the expense of waterfront public space and amenity provision for Auckland citizens, and it denies Auckland CBD businesses revenues that would acrue from higher CBD visits from locals. And it includes the provision and maintenance of Queens and Princes wharves - though this may be partly covered by berthage fees. These figures need to be put in perspective alongside Auckland International Airport which handles about 8,000,000 (8 million) international passenger movements annually - 40 x more - and with an additional runway this is projected to increase substantially. As a friend of mine in business in retail says, "if you want to know how well your shops are doing, don't count the people, count the shopping bags...."
Casual observation at Devonport, on the ferry, on Queens Wharf, around the ferry terminal, and along Quay Street tends to support the survey's findings. Cruise ship visitors do not come to Auckland to spend big money. Most of them are of limited means - just like Auckland's 1.5 million population - and they spend a few dollars on coffee, ferry tickets, meals, and the odd souvenir. It's just that they are floated into Auckland, moored at the bottom of Queen Street for a couple of days, set free (but fed and wined and dined on board if that's what they want), and then taken off to the next port of call. It is the cruise ship companies that make serious money. They get the "few thousand dollars per person" x 2000 passengers. And they need destinations like Auckland to provide berthage facilities. It is time the rose-tinted spectacles were taken off by Auckland decision-makers, and it is time to shift cruise ships off Queens Wharf, and re-prioritise that space for Aucklanders. Make it attractive and delightful for locals.